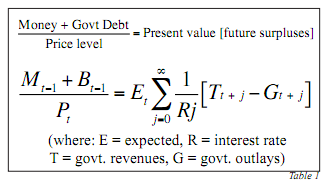 Given this equation, according to the article at this location , which provides the following equation as an argument, the author claims that he predicts "deflation" in the last paragraph of the article. From what I see, given that his article predicts a fairly constant interest rate, and the fact that we know T-G will always be negative, this seems to imply that P (price levels) , in the economy, must fall in order to equalize this equation? This seems to imply that , even though money supply is being pumped into the system, price levels MUST fall at a greater percentage rate in order to continue to equalize this equation. I am looking for comments from anyone on this equation and what it means to you. Or , if I am wrong, I am looking for a correction (as an answer to this question). The author's article does not predict constant interest rates. On the contrary, "...if nothing is politically accomplished in reducing our long-term debt liabilities, a large risk premium could be established in Treasury securities." The reason why this is the case is because in interest rates (R in the equation) adjust so that the quantity borrowed and quantity saved match. This state is called equilibrium. Also, as the article points out, the US government through Fed purchases of US treasuries is merely changing the composition of its liabilities. Longer-maturity bond liabilities of the US treasury are replaced with zero-interest perpetually revolving liabilities of the US Fed redeemable at par (we call this currency or reserves). The net effect is to shorten the average maturity of US obligations as whole. Now of course we do not expect the Fed to "redeem" currency with gold, bonds, or some other asset so arguably you can remove this from the numerator of the equation. Regarding whether T-G must will remain negative in perpetuity... If bond markets lose confidence in the long-run expected outlays vs. revenues then the value of US Treasury bonds will drop (and equivalently interest rates will rise). At the extreme, bond markets would not finance expenditures in excess of revenues so there is a constraint on fiscal recklessness (witness Greece). On the other hand, a government can indeed revolve debt in perpetuity so long as the capacity of the government to pay increases with liabilities (i.e. the growth in tax revenues is >= the nominal government interest rate). Finally, another way to look at the relationship between money supply and price level is the Money * Velocity of money = Price * # Transactions relation. The Fisher hypothesis is that even though the money supply has expanded dramatically, the velocity of money has slowed by an even greater amount. Indeed this is the case of the last several years and the story of Japan. Therefore, price level can drop despite increases in the money supply.